come and visit our fantastic, recently refurbished play area, Dewi's Den. A Fantastic facility for children that allows then to exercise whilst learning and developing basic skills such as balance and co-ordination. 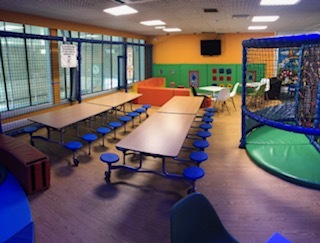 The main soft play area is designed for 3-10 yrs of age with a additional area suitable for toddlers.There are comfortable sofas readily available for parents whilst watching their child have hours of fun. Dewi's Den is available to hire for parties/groups throughout the week. Our parties range from 90 mins to two hour slots, with a maximum of 30 children. Pop in to book your child's party, just a £10 deposit to secure your booking.